Malayna Dawn and Stacy Macris Ros met at Unity Kids Camp at the age of 10. As teens, they were regional leaders of the Youth of Unity, with Stacy as the Regional Rep. and Malayna as her Associate. 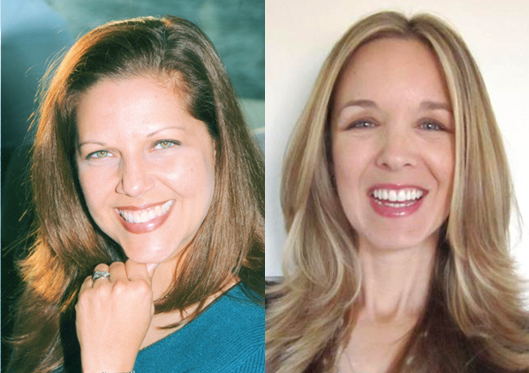 They went on to do grown-up jobs in media and spirituality, and now they share their friendship, and their love of Pop Culture and Spirituality on their podcast entitled…POP CONSCIOUS on Unity Online Radio. Malayna Dawn worked in many facets of the entertainment industry before becoming an internationally published freelance writer and author, and an online media consultant. She’s a rare third-generation Unity student who brings her work experience and pop culture obsessions, multi-cultural background and love of symbolism and metaphor to the show. Growing up in the suburbs of Hollywood, her makeup artist grandmother got her involved in Unity and in the entertainment industry as a child. Malayna put her Communications degree to use working behind-the-scenes in Radio, Television, Print Media and live events, both in the U.S. and her 12-year home of Sri Lanka. As the author of a spiritual adventure novel, Echoes Across Time, and co-founder of Spiral Whirled Travels: a website about World Travel, Time Travel & Flights of Fancy, she spends a lot of time in her imagination, and invites you to join her there while she racks up those SEE credits on her way to ministry! Stacy Macris Ros is a Certified Spiritual Educator and the Southwest Unity Region Youth & Family Ministry Teen Consultant. A lifelong Unity student who also grew up in the L.A. suburbs, Stacy continued in Y.O.U. after high school to be an International Y.O.U. representative, before eventually making spiritual education for teens her career. She also holds a Masters Degree in Public Health and is a Certified Reiki Master. She’ll be bringing her insight into “what the kids are into today” along with her experience as a spiritual coach. Learn more about her work at www.swunityyouth.org. Find out a little about their supportive Unity community at www.unityoftheoaks.org. Our fabulous announcer-man, Bob Bendick, has many episodes of his own podcast, The Bob Bendick Podcast, available on iTunes. (Think ‘Inside the Actors Studio’ but funny – with the aim of educating aspiring actors, writers, directors etc. while in front of a live audience at the famous ACME Comedy Theatre in Hollywood.) Bob has experience as a crew member on films, has been seen on television commercials and promotional clips, and can be your announcer man too! He’s available for commercial and animation voice-overs through Mike O’Dell at the Bobby Ball Agency. Michele is a member of Unity Spiritual Center in Westlake, OH, where she serves on the board, but she’s also been a historical center docent, a ghost story tour guide, and a spiritual stand-up comic. She uses her good juju in her work for a large bank, and on the side has a business as a Soul Coach® and Clutter Clearing consultant, inspiring others to create their own authentic life experiences by releasing stuck energy and attachment to things that no longer represent who they are now. Contact her at michele [at] popconscious.com!